Get $/€/£/CAD$ 200 Welcome Bonus and 10% Cashback Bonus Each Month! Mermaids Millions is a fun underwater fantasy theme game. It has 15 pay-lines with coin wagers ranging from 1 cent to 1 dollar. You can bet from 1 to 5 coins per pay-line. 4 alphabet letters and the number "10" with sea creatures wrapped around them make up the bulk of the reel symbols while a pearl oyster shell, sea horse and a jewel filled box make up all but the last three. A "Neptune" acts as wild symbol and pays when combined with any 2 symbols except for the bonus round symbols. There are two ways of getting bonus rounds in Mermaids Millions. If 3, 4, or 5 bonus treasure chests stop on a covered pay-line an underwater scene is displayed with colorful seashells and a variety of wooden barrels and chests. You get to pick 1 seashell, barrel or wooden chest from the under water scene for each bonus treasure chest that stopped on a pay-line. When you select an underwater item it opens and is filled with gold dust or gold coins. Your win amount is revealed which can range from 36 to 2500 credits or coins depending on how many treasure chests stopped on a covered pay-line. Once in awhile you get all 5 bonus treasure chests but most of the time it is 3 or 4. 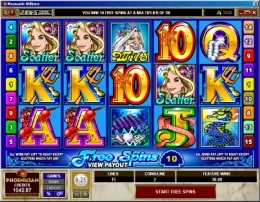 The scatter symbol is a pretty, blonde haired Mermaid that pays twice your wager when you get 2 and triggers 10 free spins that pays triple your wager when 3 or more stop anywhere on the reels. Get 3 or more mermaid scatter symbols during the free spins and you retrigger the free spin feature. You can also get the treasure chest bonus during the free spins.